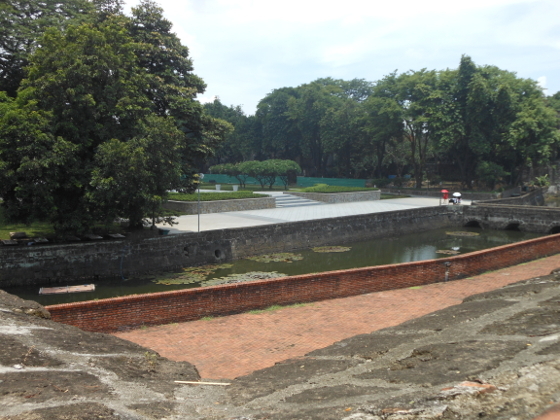 Fort Santiago may be one of the most gorgeous and underrated places for a writer's retreat. 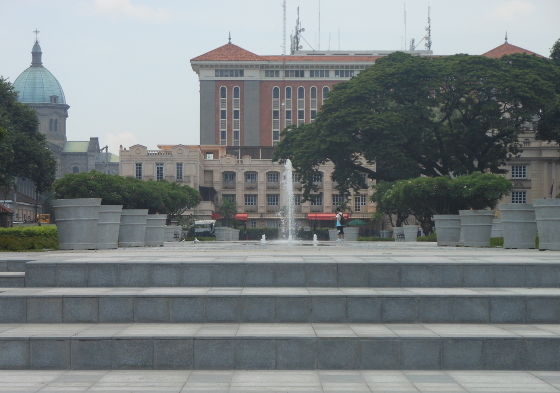 This visit, we timed our look-see for the Book Stop Library installation in front of the Manila Cathedral so that we could enjoy one more great reason to have a whole-day, writer's retreat in the area. 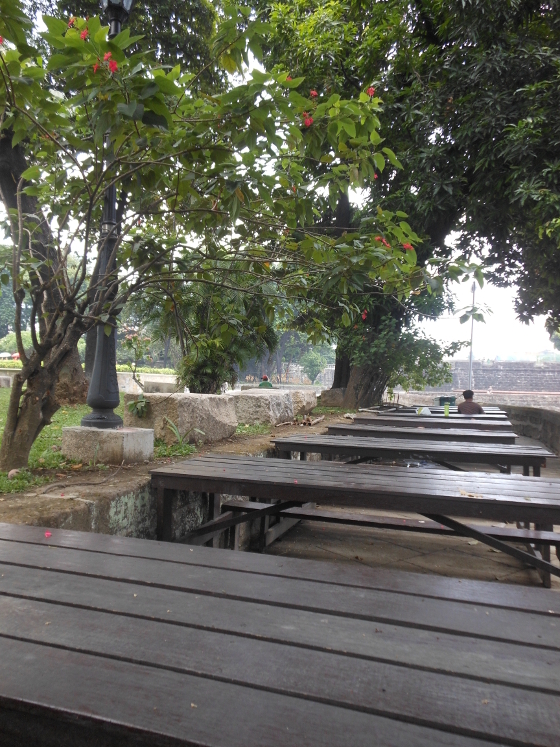 You can do some reading and longhand writing on a journal right where the Book Stop Library installation is set up, or you can wander down into Fort Santiago and grab the nearest park bench or nook along the parapet walls for plopping down and writing all afternoon long. 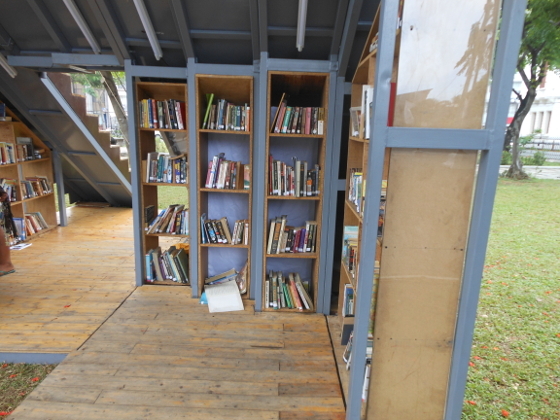 A Book Stop Project mini-library installation in any park in Metro Manila usually runs for a month to a month-and-a-half. It is a workshed-like design with a small shelf stack for a load of books, which visitors may pick up and bring home, for as long as they swap another book to replace it. 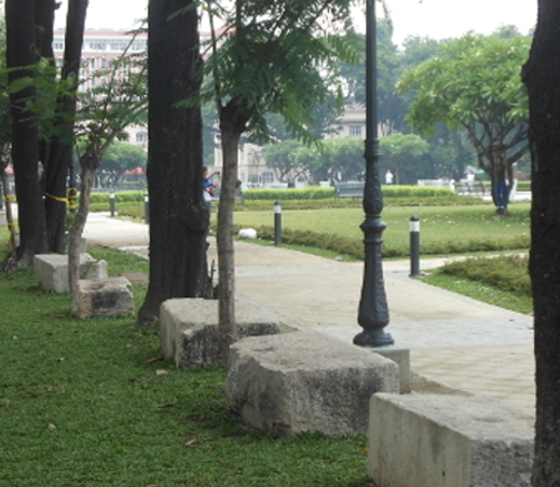 Of course, one must swap good books if one is getting a good book from the Book Stop, so that more people would use the place to find good reading whenever the installation is ongoing at any city park. 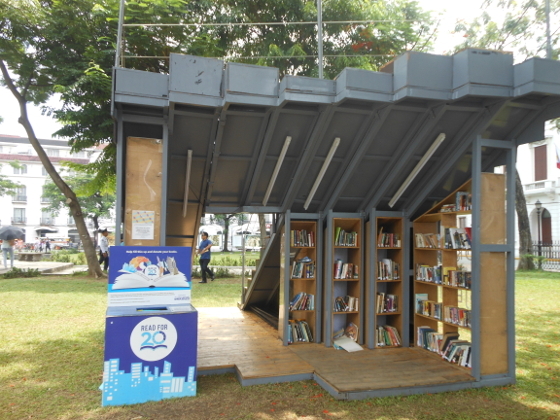 The Bookstop Project is initiated by WTA Architecture and Design Studio as part of its advocacy of social architecture geared for making communities enjoy the places they live in--and mini-libraries is a big part of their various city living showcase installations. As a hangout for book lovers and as a writer's retreat, the Book Stop Project is simply unbeatable as a budget place for making tambay, reading a book for an entire afternoon, or spending the day at the place with a thick notebook journal and writing your ideas or stories. As a writer's retreat for cheap, you can spend weekends at a Book Stop Project mini-library and take breaks for grabbing grub at the nearby food kiosks or carinderia, or bringing your own picnic baon to the place and nosh while you're busy writing the next great Pinoy eBook novel. 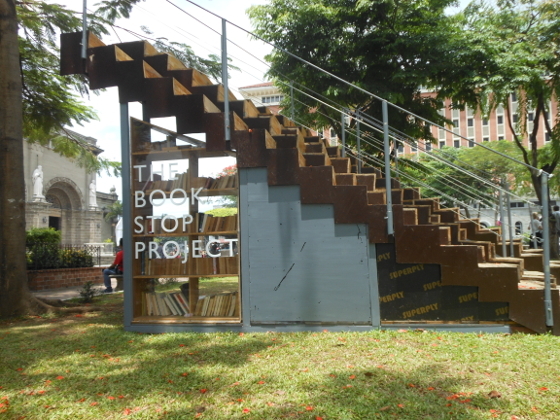 The current Book Stop Project in Intramuros is designed like a book shelf room under two staircases--a great design idea for building one in your own backyard or home, and you can inquire at the design firm if their plans for building the installation are open source or affordable if they help you build it themselves at your home or community. 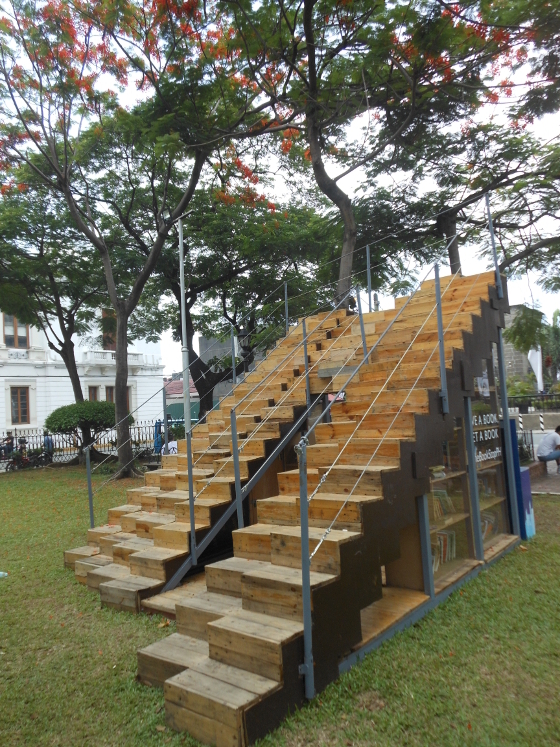 If you get lucky during the summer, and there is enough cloud cover to keep direct sunlight from giving you heatstroke, you can hang all day at the Book Stop Project's reading area steps and write all day. 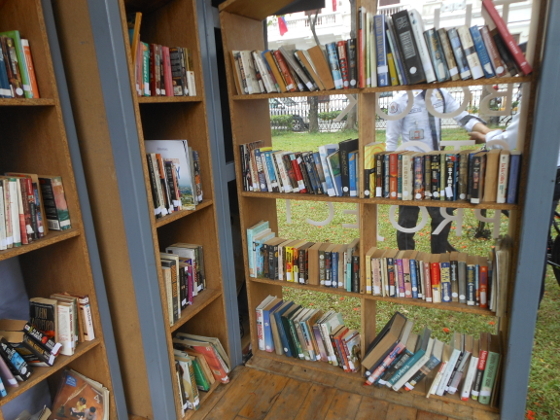 Be on the lookout to wherever park in Metro Manila, they set up their mini-library installation so you can visit there and pick up some books or donate some books as well, and use the shack as your writer's retreat hangout. 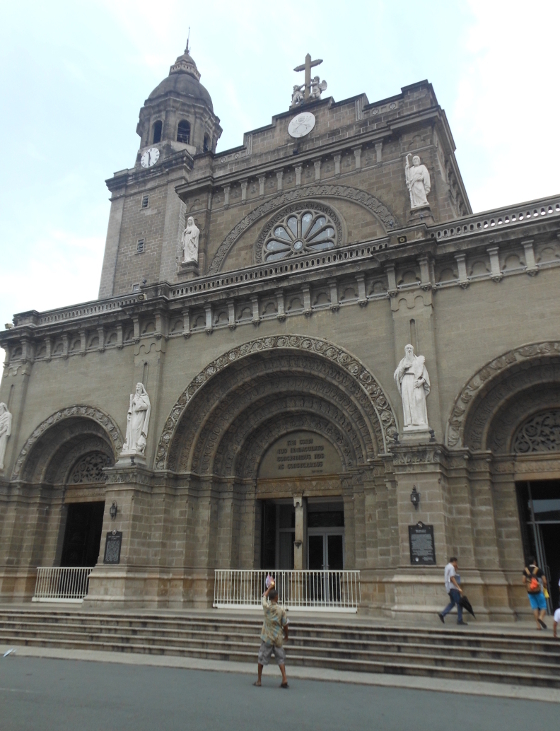 Why Not Manila Cathedral as Writers Retreat? 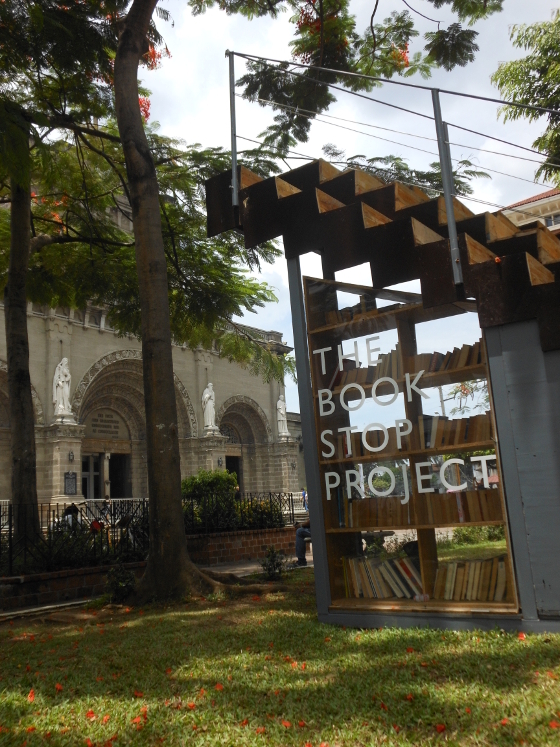 The Book Stop Project was set up just outside of the park fronting the Manila Cathedral, a small forest garden by itself which gave us a really sweet idea--why not hang out inside the church and write if they won't shoo you away. Writing is as good as praying, because you are gathering your thoughts and laying them all down, and inspiration from the Lord should help you flesh out your stories and poems better if you had a church as a writer's retreat. The Manila Cathedral is a gorgeous heritage site, church that by itself is a wondrous place for meditating and spending some time communing with one's Divine and Benevolent Maker, but it can also be a hangout for a writer's retreat, as long as snooty priests fon't give you time of day for sitting in the church pew and writing stuff by yourself and bothering no one. 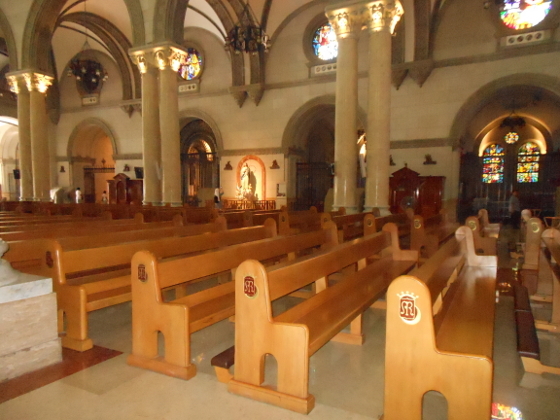 The Manila Cathedral as a writer's retreat also may be one of the best tourist come-ons that works by itself: visitors coming in to pray for guidance and inspiration, for their personal writing projects--and you can't put that down as frivolous or vain. 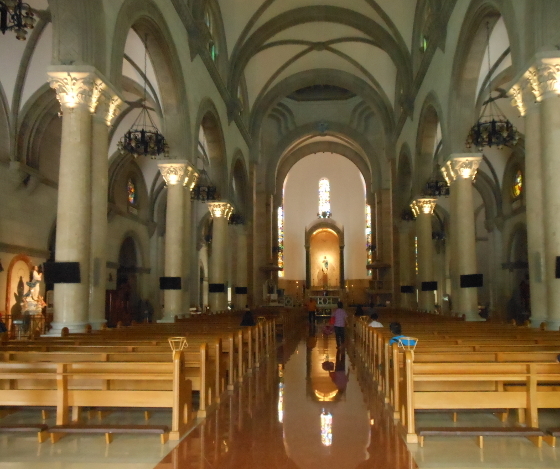 Look at the images we got of the Manila Cathedral and see if you think the church should make a great destination for writers to hang out on a sweltering summer afternoon. Jesus didn't kick aspiring or seasoned writers out of his temple, Jesus kicked out swindlers aka money changers. Besides, wouldn't the Lord have more successful writers, or happy writers, working out their craft at his holy place, with solemn inspiration? 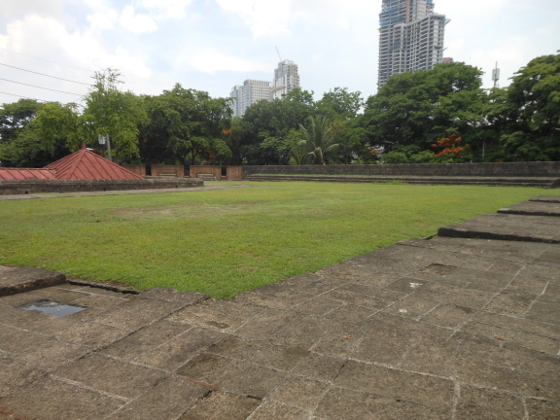 The Book Stop Project and the Manila Cathedral are the special treats in Intramuros, where you can hang out and write, when these places are available, or are open to the public during the summer. 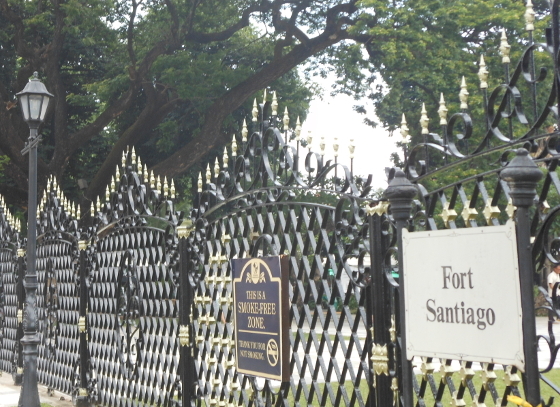 On regular days of the year, you cant still visit Intramuros, for the heritage houses where you can also hang out, but the most accessible place for your all afternoon writing downtime should be at Fort Santiago any time of the year. 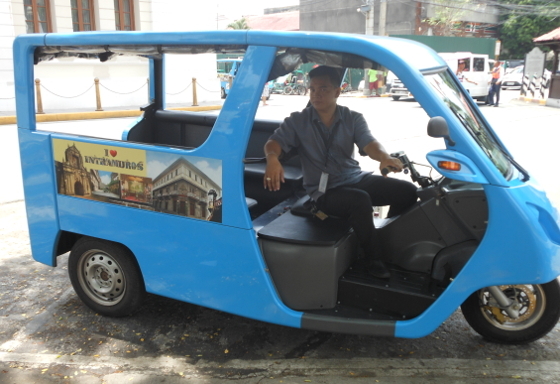 You can get to the Intramuros complex from Quezon City via jeepney into the Manila Post Office area which is near Letran University. 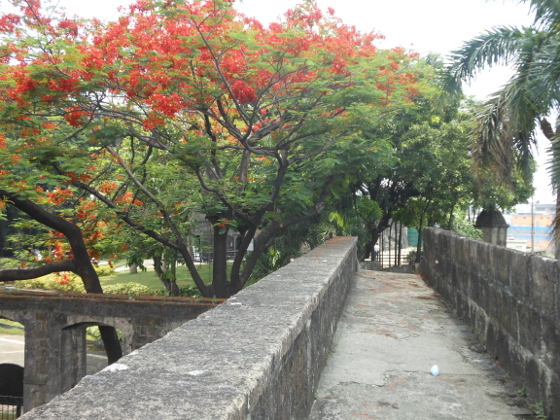 You will find a gated fortification known as the Baluarte de San Gabriel, which is already part of Intramuros complex, and wait for one of the blue taxi-trikes roaming around Intramuros as the official ferry for visitors in the area. A P25 fare or cheaper can take you near Fort Santiago--which is your primary destination in the area for a writer's retreat. 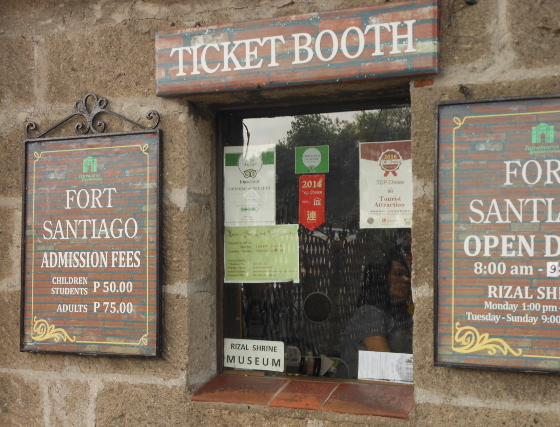 Entrance to Fort Santiago will cost you P75, and the place is usually open until 9PM in the evening. 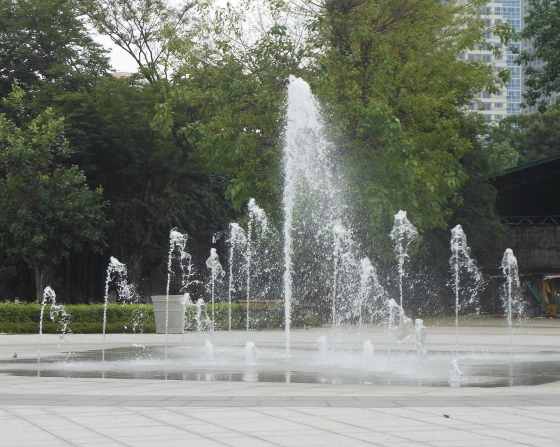 The Park's cascading water fountain is lighted during nighttime for a simple, yet delightful treat at the end of the day. 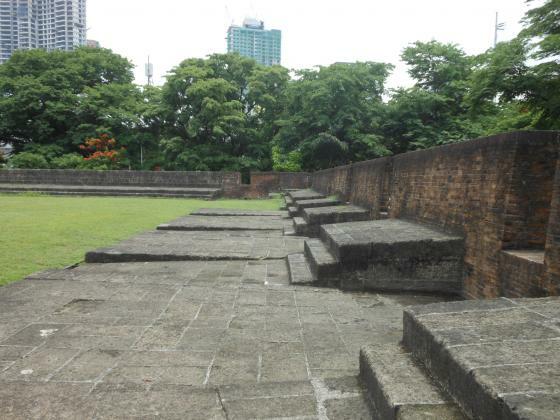 Intramuros used to be ALL of Manila for the Spanish occupying government, and its assorted mestizo entourage of supporters. Now, the walled city is a heritage site with all sorts of nooks and crannies and museum places, and resto-cafes, where you can hang out and enjoy all the Filipiniana tourist trap ambiance and Pasalubong merchandise. 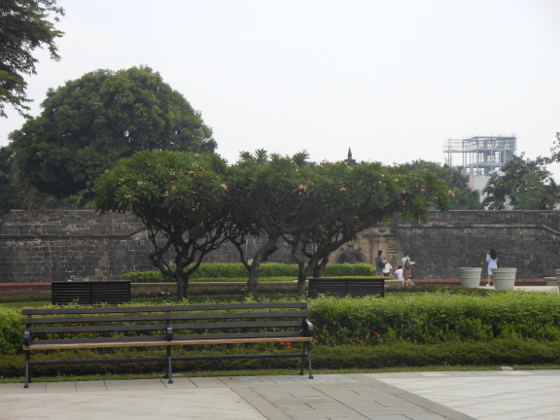 Intramuros Manila also has Fort Santiago where you canget lost for a while finding yourself a quiet place to write your story drafts or work ideas. There are also several Philippine universities situated in the area, from Letran, Mapua, Manila high school, and Centro Escolar. 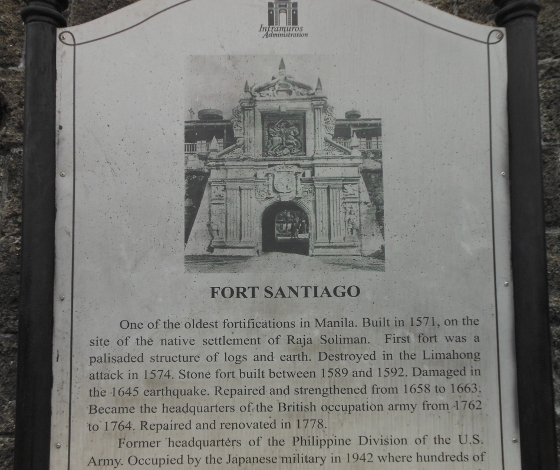 Fort Santiago is situated in one corner of the Intramuros complex, the riverside corner where it was the main defense point of the Manila community in Spanish times against pirates and hostile nations. 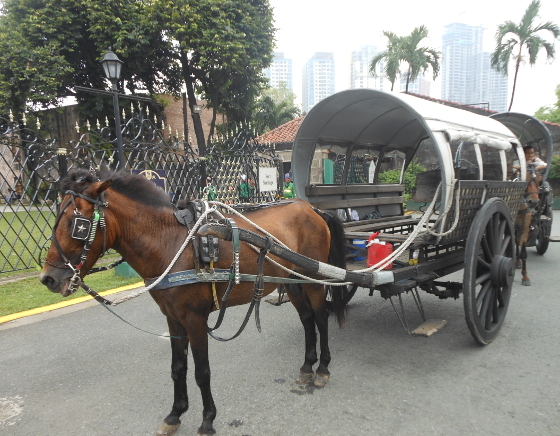 Inside Intramuros, there are also designated calesa karwahes (coaches) some for a group of 2 and others with larger and longer carriages for bigger groups who may want to tour the old fort city by horse-drawn carriage. 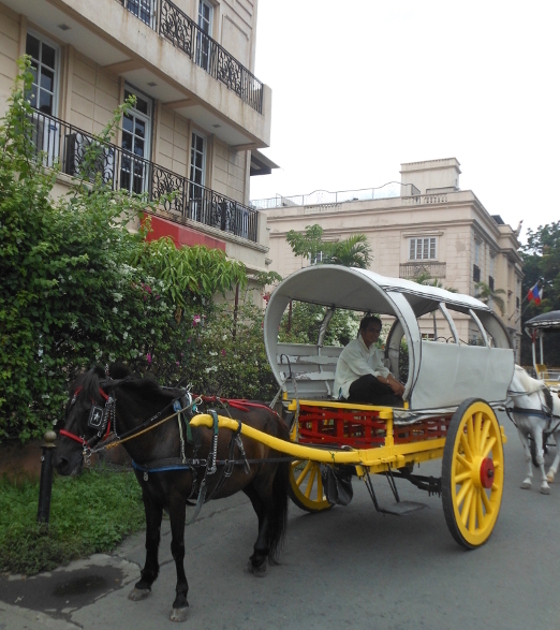 A quick question to one calesa driver about fare for a casual ride-around Intramuros indicated that the going rate was rather steep and tourist-pegged (P350)--but that's still not bad for an afternoon ride around the park in a gorgeous horse-drawn carriage. 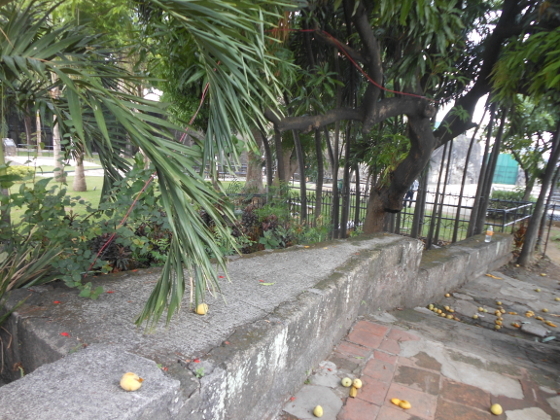 Inside Fort Santiago park is a sprawling forest garden with attractions like a pigeon roost, a cascading water fountain which is lit up in the evening, benches near the moat area, a Rizal- themed museum, and several souvenir shops and in-park restaurants. You can plop down on any park bench and pull out your journal notebook to start the day writing or you can find some nook along the walled parapet for a more interesting writing sconce for your all-day ritual. 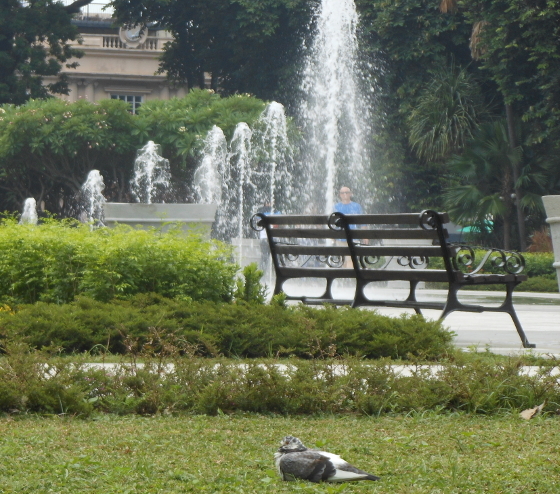 The Manila summer can get oppressive so you may want to move around the park to find a shaded place for continuing your afternoon if the sun gets too hot. Writer's retreats/residencies are usually organized trips to a particular off-grid destination like a farm or mountaintop village (like a field trip) for a group of writer wanna-be's so they can spend 8-hours a day on their writing. Writers who go on this adventure then workshop the results among themselves with the help of some published-author mentor and decide if they pass the manuscripts to publishers or publish on their own. But this does not mean everything has to be expensive and you can simply find a place in the city or community where you live that is quiet, safe, and has a place where you can write all-day long, walk around the block and grab some comfort food, then return to your hideaway for more writing. In Manila, this sort of group activity hasn't taken off as a trending way for spending downtime like it has in the West, but there are local organized writer workshops and writer fellowships--which are put together by academe and so-called Palanca-winner alumni (for ivory tower credibility--if that is what you consider an achievement or hallmark for an accomplished Filipino writing career) every year or so in places like Baguio or Davao or Tagaytay. Since REACH is a reading advocacy, we are looking at places in the Metro or just outside Manila where you can spend a writer's retreat for an afternoon for a song. If you can go it alone or at least drag a friend out on a weekend, where you can both plug away on your notebook device or scribble longhand on a notebook journal there should be plenty of hideaway places in urban Manila for budget writer's retreat destinations for the harried writer-in-the-making. 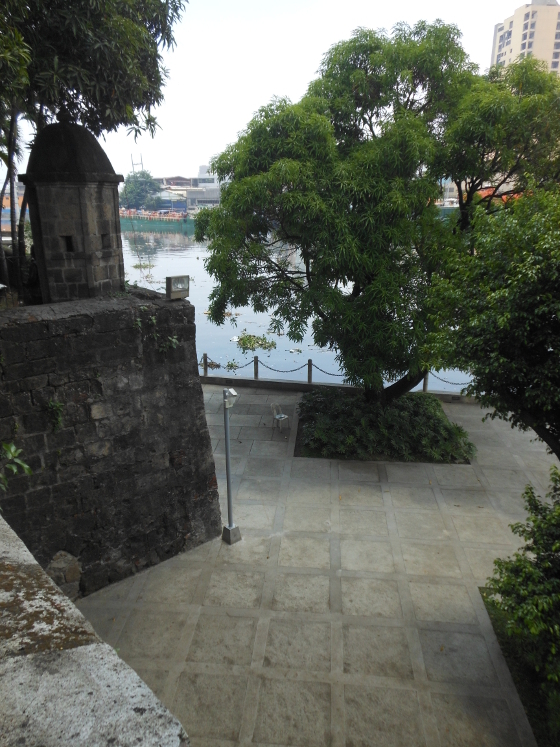 Intramuros is an amazingly underrated place for a writer's retreat. If you are pining to get work done for your own book, or just want to get your Me-time to test your chops as an author, you don't need to spend P39,000 or more (the going rate of one overzealous and creepy lifecoach-spa-writer's retreat package this year--HAH!). There are other old churches within the Intramuros compound aside from the Manila Cathedral, where you might be able to hang around to write your stuff. If you can brave typhoon weather and if it is allowed to romp around the walled city of Intramuros in bad weather for a writer's retreat, you can jumpstart your story with "It was a dark and stormy anything..." amid all of the period architecture in the old world heritage site as long as you can stay dry and have light to write everything good down. Visit there now, and find your perfect spot, or nooks so that you can plan ahead and just go to the places you've marked as badasss budget writer's retreat tambayan on weekends.